The main teacher for this class is Mrs. Orledge. We started the half term with a WOW week to compliment our topic on 'The Great Outdoors'. We have been learning all about our school, it's history and what lives in the school environment. On Monday we had a visit from Pat Nicholls who told us all about how the school came to be here and explained to us that it used to be run by nuns. Later in the week we have studied the native trees, flowers and mini beasts found in the school grounds. 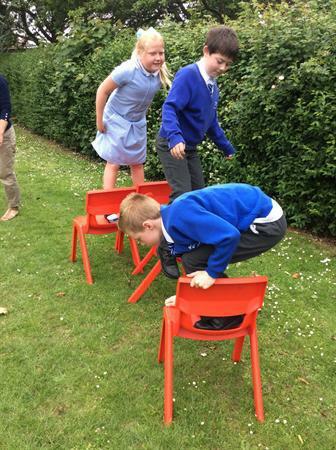 We finished off on Friday by enjoying the outdoor, learning together through team building exercises. It was a lot of fun. There are lots of photos of us in the gallery section!!! We will continue this topic by studying the life and growth of plants in the coming weeks. The fun continued throughout May as we learnt all about France, it's regions and culture. We enjoyed map work, comparing climates and contrasting the school systems to name but a few. In English we worked hard to improve our punctuation and grammar and to write some truly excellent non chronological reports about France, some are on the wall - do come in to see them if you have the time. As part of our computing we then converted paragraphs of our reports to QR codes and presented them on posters. In maths we have been learning about fractions and decimals. 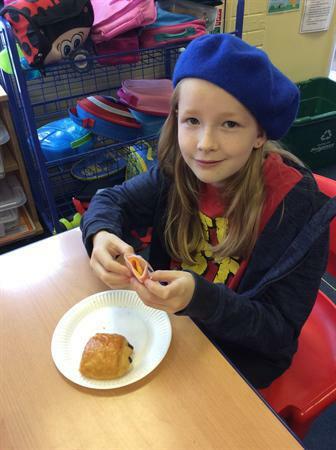 We kicked off the new term in grand style with our French day and French breakfast! (See more photos below in the gallery) We are really looking forward to finding out all about 'Fabulous France' this term. The children have been working hard on their story writing skills, we have really enjoyed reading the graphic novel 'Roman Rescue' - our stories are based on this! You can hear one of our stories and all about the other things we have been learning at our class assembly on Friday 31st March at 9.05am. Work on our topic 'The Rotten Romans' has continued apace! Recently we have done a lot of work on our Roman sheilds and had a fun art morning on Friday where we got really sticky doing papier mache - luckily we were wearing aprons!! Take a look at the photos of us below! In maths we have been revising addition and subtraction and have been doing a lot of reasoning work to show Mrs. Orledge how well we can use and apply our skills. On some days we have been choosing our own level of work - this has proved very successful with lots of us challenging ourselves with some tricky tasks! Our half term English tests on SPAG (spelling and and grammar) and reading show good results and we are all improving all of the time! We have been listening to the Roman song Mrs. Orledge is going to teach us after half term and we are very excited to get started with it. Hopefully we can sing it in our assembly! In RE we are studying Islam which is very interesting. We have had a fantastic start to our new topic 'Rotten Romans'. Although wet, the trip to the Roman Legionary museum, baths, barracks and amphitheatre was very popular with the children and certainly filled them with enthusiasm! (they were especially keen to see the remains of the communal Roman toilets!!) Please take a look at our photos below. In English we have been studying a playscript filled with facts about the Roman invasion. We have enjoyed acting it out with plenty of expression and following the stage directions. 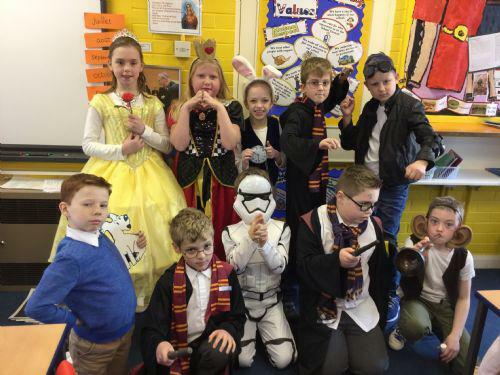 This week we gave a performance to the year 3 children. (Again, see our photos below). We really improved upon our performance skills with a real audience and year 3 had a great time watching!! Following on from this we are writing and editing our own plays. Mrs. Orledge is very impressed by our style and our use of Roman names and settings. We are using lots of adverbs in our stage directions and making sure that a variety of sentence lengths are used in our dialogue - just like in real life! Our maths work so far this term has been based on place value, this has tied in nicely with our topic as we have been using Roman Numerals to cement our place value knowledge! In RE we are currently studying the church community. Papier mache fun - we're making our Roman shields! Acting out our Roman play. Multiplication.com Practise your times tables here! 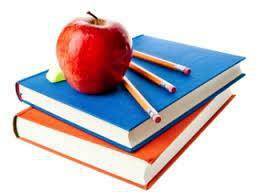 IXL website link for English and Maths homework.